This month we are going to look at three performance-oriented designs. It's probably fair to call all three "racing boats." I'll start with the Finn Flyer because I think of all three most of us can easily identify with this one. The other two push the performance bar pretty high but it's always good to know just where the bar is these days. The Finn Flyer was designed by Karl-Johan Stråhlmann, and that is a new name for me. The boat is clearly a racer-cruiser type due to its accommodation plan and the fact that there is no mention in the material I have of a one-design class. This boat appears to be designed to offer good, aggressive club racing and comfortable cruising. Without any disrespect I would call this design the most generic of the three this month. The boat is light with a D/L of 120, and of moderate beam with an L/B of 3.41. In plan view the boat resembles pretty much any modern boat with a wide stern. The profile shows the typical snubbed bow overhang and modest stern overhang designed to provide max DWL for boat speed while not dragging too much of the transom when the boat heels. You can have your pick of three fin-and-bulb keels ranging from 8 feet, 3 inches draft for the "club" model to 6 feet, 7 inches for the "shallow keel." The keel fin is stainless steel. The rudder looks really big to my eye and more than 50% of the keel fin area. The accommodation plan holds no surprises. There are twin quarterberth staterooms aft with small hanging lockers and bureaus. The engine box is under the companionway steps. The galley is adequate, but by now most of you know I like counter space on each side of the sink and this design has none inboard. Outboard there is counter space but that space is also the access lid to the reefer. With this arrangement meal preparation would not be very convenient. "Tonight's menu features two entrees, peanut butter and jelly sandwiches or jelly and peanut butter sandwiches." But, to be fair, compared to my 26-foot Perrywinkle this galley is huge. The nav station looks good. Note in this layout how the plumb stem works to the advantage of the V-berth. This V-berth has lots of width at the foot. This would be a very comfortable berth. I'm not quite sure but it looks to me like there is a small seat in the V-berth stateroom. I'd lose the seat and make the berth longer. All in all this is a good layout that gives private accommodations for three couples. That comes at the expense of a large lazarette though. But for short-range cruising you could be quite comfortable on this boat. The promotional material mentions an optional layout with a second head that must go where the nav station is on this layout. 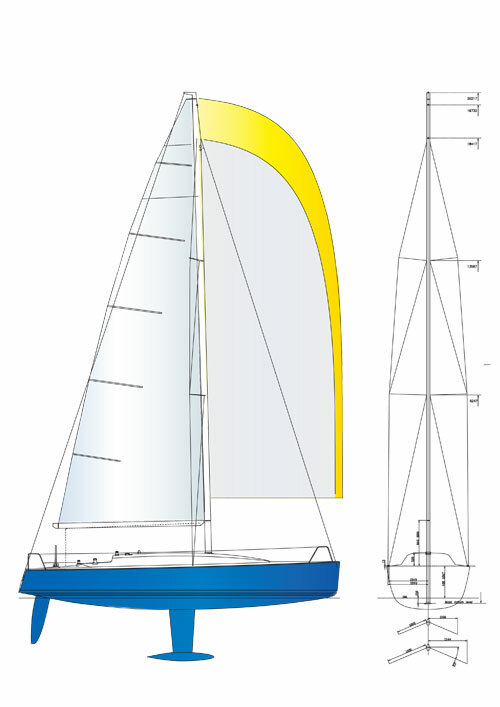 The sailplan shows a very good-looking boat with a subtle sheer spring and moderate freeboard. I really like the way the cabintrunk is contoured in profile as it curves down slightly as it goes aft. The overall look is very clean and well proportioned. The fractional rig has a generous SA/D of 27.13. Masthead and hounds chutes are shown. The spreaders are swept 23 degrees and the chainplates are out at the rail. The deck features a large cockpit for racing with optional twin wheels aft and short cockpit seats forward. The mainsheet traveler is just forward of the wheels. It looks like halyards are led aft in a recess from the mast to the "pit" area adjacent to the companionway. The Finn Flyer is built in Pietarsaari, Finland, by Finn Yachts Ltd.
LOA 41'8"; LWL 36'11"; Beam 12'3"; Draft 8'3" (club), 7'1" (standard), 6'7" (shallow); Displacement 14,991 lbs. ; Ballast 5,952 lbs. ; Sail area 968 sq. ft.; SA/D 25.47; D/L 120; L/B 3.41; Auxiliary Yanmar 39-hp; Fuel 58 gals. ; Water 30 gals. Finn Yachts, Båthuset i Mariehamn, Vikingagränd 1 22100 Mariehamn Åland, +358504674988, www.finnyachts.fi.